"a party of seven or eight soldiers, were detached from the main-guard, under the command of captain Preston, and by his orders fired upon the inhabitants, promiscuously, in King-street, without the least warning of their intention.."
"A general attack was then made on the men by heavy clubs, and by snow balls, by which all our lives were in imminent danger; some persons behind called out 'Damn your bloods, why don't you fire?' Instantly three or four of the soldiers fired, one after the other, and then directly after three more, in the same confusion and hurry." The British newspaper/magazine "Gentleman's Magazine" gave top billing to the "Report of the Committee of Boston, on a late Massacre" as shown by a portion of the front page index pictured above. The following page was the full page report of the committee which was signed by John Hancock, Dr. Joseph Warren (as General Warren he was killed at the Battle of Bunker hill, famously portrayed by Jonathan Trumbull in his painting of the battle). Below is the start and end of the report with the top portion of the signatures of the committee members. 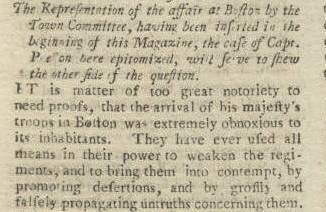 Captain's Preston's Account of the Boston Massacre was, of course, quite different than the Boston Committee. John Adams later successfully defended Captain Preston, whose account of the incident proved more accurate than the Boston Committee's report. The courtroom scene in the HBO series "John Adams" was good theatre and very close to being historically accurate. 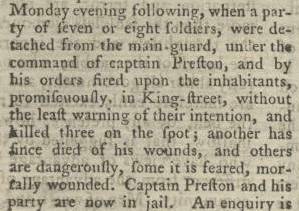 Below are portions of Captain Preston's account. 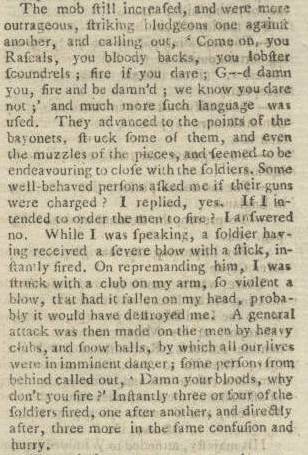 Also in this issue, British champion of liberty John Wilkes writes a letter from prison where he was confined from speaking against King and Parliament. His election as a Member of Parliament had been nullified because he was in jail. Wilkes eventually got his revenge, being later elected the Lord Mayor of London and Member of Parliament. He was an ardent and commendable advocate of Freedom of Speech and Freedom of the Press and opposed British policies regarding the American colonies. The 47 page magazine is in very nice condition, disbound and with with no significant defects. The volume is complete except for a plate of the "Plan of the Bay of Santerini." A very historic issue with a two wonderful accounts of a famous violent incident that increased antagonisms between the British and Americans and led to the Revolutionary War.